Go through the door. Next go through the door to the top-right. Go through the door directly to the left and get the Map from the chest. Go back out and head up. Fall down either of the holes. Kill the bomb bugs to proceed. Head down (avoiding the fire snake) and go into the bottom-left door. Push the statue onto the button under the top-left pot and open the chests for the Fire Shield and Compass. Now head back out and into the door to the top-left. Light the torches to reveal a chest with a Small Key. In the next room simply go upstairs. The holes will drop you down onto the floor you were just on, so try not to get knocked into them by the cannons. At the bottom lift the left-hand pot for door-opening button. In the next room head down and into the left-hand door (avoid the spike thing by going around it and timing your actions). Pull the left-hand tongue to reveal a chest with the Big Key. Return to the room with the circling fire. Head north and open the Big Chest fot the Hookshot. If you want to skip the following part warp back to the entrance and open the Big Key door in the main room. Otherwise head back towards the fire and this time head right. Kill the Stalfos and Eyegores and continue onwards. In the next room use the Hookshot to cross the gaps and then go upstairs. 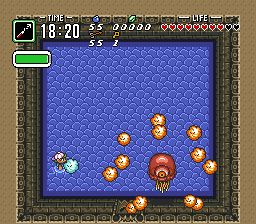 Head to H-7 (the room with the Stalfos and Eyegores), bomb the top centre of the wall and pay 100 Rupees for +10 arrows. In this room use the Boomerang to fetch the Small Key (the Hookshot can't grab it). In the next room Hookshot down, right, and finally left to cross the spikes without damage. Go through the door. Now you're back in the main room! Head up and unlock the Big Key door. Use the Hookshot to go up, left, down, left, up, up, down, right, right, up, left, and finally though the Big Key door to fight the boss, Arrghus. Use the Hookshot to pull the pieces away from his body, and then hack them up. Remember you're invulnerable when the Hookshot is extended, so you can use it to protect yourself when he does his "spin ball bits around body" move. Once his bits are all gone he'll jump up into the ceiling and try to crush you. This page was last edited on 18 January 2012, at 10:35.